We’d love your help. Let us know what’s wrong with this preview of So Much Life Left Over by Louis de Bernières. Rosie and Daniel have moved to Ceylon with their little daughter to start a new life at the dawn of the 1920s, attempting to put the trauma of the First World War behind them, and to rekindle a marriage that gets colder every day. A sweeping, heartbreaking novel following Daniel in his troubled marriage with Rosie as they navigate the unsettled time between the World Wars. To ask other readers questions about So Much Life Left Over, please sign up. Is it better to have read The Dust That Falls from Deans first? Dorothy I did but I find that this novel stands alone and could be read out of order. Louis de Bernieres writes a beautiful, emotionally heart tugging, often humorous, epic look at the lives that survived the horrors and losses of WW1, focusing on the inter war years and the human costs incurred at the beginning of WW2. In what is a relatively short novel, a large cast of characters, their lives, decisions and behaviour are portrayed as times change. Half French Captain Daniel Pitt, well known ace fighter pilot, had never expected to survive the war, and has to resolve the quandr Louis de Bernieres writes a beautiful, emotionally heart tugging, often humorous, epic look at the lives that survived the horrors and losses of WW1, focusing on the inter war years and the human costs incurred at the beginning of WW2. In what is a relatively short novel, a large cast of characters, their lives, decisions and behaviour are portrayed as times change. Half French Captain Daniel Pitt, well known ace fighter pilot, had never expected to survive the war, and has to resolve the quandry of what do with so much life left over. The author presents the lives of the families of Daniel, who had lost two brothers, and his wife, Rosie, who lost her love, Ash, in the war, as they marry, and those with connections to them through these historically turbulent times, whilst pondering over the myriad of roads not taken. Daniel and Rosie move to Ceylon, under British colonial rule, running a tea plantation. Initially the couple are happy, they have a daughter, Esther, but things begin to disintegrate when Rosie gives birth to a dead son, despite going on to have another son, Bertie. Using religion as an excuse, Rosie withdraws from sexual relations with Daniel and refuses to let him have contact with Bertie. A frustrated and unhappy Daniel finds himself in a relationship with 'native' girl, Samadara whom he grows to love, only to have his life shattered by Rosie insisting they return to Britain. Full of rage and anger, understanding that women are now expected to keep their children in this age, he feels he has no choice but to acquiesce to Rosie's demands. Through the years, Rosie does all that she can to keep the children from Daniel, lying and deceiving to ensure this whilst refusing him a divorce that would allow him to marry another woman. She has sufficient self awareness of her abhorrent actions, but is unable to change course. She has three sisters, Ottilia, who had wasted her life loving Daniel's self destructive brother, Archie, a lost and haunted man brimming with self hatred, finally reaches the point where she is finally able to move on. Sophie marries a clergyman but they are a childless couple. The bohemian Cristabel settles into a relationship with Gaskell, making remarkably unconventional decisions. Daniel finds himself loving women but unable to marry given Rosie's intransigence, he moves to Germany to see up close the rise of Nazism with Oily Wragge, a man tortured and enslaved by the Ottoman Empire in WW1. The onset of WW2 has the characters doing their part in the war effort and inevitably faced with the tragedies that ensue. I may well have enjoyed this book more had I realised it was book two of a series with the Novel The Dust That Falls from Dreams being the first in the Series by Louis de Bernieres. I picked this one up in hard copy and it didn't state that it was part of a series on the jacket or in the premise which seemed a shame. I found the book very difficult to get into and could not keep track of the characters until half ways through the novel. I was confused by who was who and I didn't find the charac I may well have enjoyed this book more had I realised it was book two of a series with the Novel The Dust That Falls from Dreams being the first in the Series by Louis de Bernieres. I picked this one up in hard copy and it didn't state that it was part of a series on the jacket or in the premise which seemed a shame. I found the book very difficult to get into and could not keep track of the characters until half ways through the novel. I was confused by who was who and I didn't find the characters vivid or realistic but this may be down to the fact that I hadn't read the first book in the series and therefore missed crucial insights in to the characters personalities. It was only on completion of the novel that I realised it was part of a series and therefore may be the reason I had difficulty connecting with this story. Daniel Pitt and Hugh Bassett suffered from the accident of not being at war. Even in a land as beautiful and surprising as Ceylon, they missed the extremes of experience that had made them feel intensely alive during the Great War, in spite of its penumbra of death. …There is a kind of man who, having been at war, finds peacetime intolerable, because he cannot develop the civilian’s talent for becoming obsessed with irrelevant details and procedures. …and, above all, he hates the feeling that what he is doing is not important. Daniel seeks solace in an affair with a Tamil tea-worker, Samadara, which blossoms into mutual love. Delightfully told from both sides. Even recognizing the affinity with colonial exploitation, it’s hard not to root for Daniel to harvest some loving from the oven. Meanwhile, Rosie soldiers on, but despite the birth of another child, she can’t abide Ceylon anymore. She precipitates a crisis for Daniel when she insists on moving back to England, ostensibly to care for her dying father and be closer to her three sisters. Daniel loved the huge and beautiful machinery in the factory, and could not resist rolling up his sleeves and helping the Singhalese engineers when it broke down. Machinery was so much easier to deal with than people. …People were slippery and elusive, changeable and moody. You thought you understood them and then found out you did not. You thought they loved you, and then they suddenly turned spiritual or indifferent. So that is basically the setup at the beginning. Soon we step off into more venues, first England and immersion in Rosie’s colorful family and then Germany and a business venture ill-timed for their poor economy and early growth of the Nazis. These interludes seemed a bit diffusing and less coherent than the first part of setting the stage, but it was a great opportunity for de Bernieres to treat us to his usual panoply for colorful minor characters. For example, the lowly family gardener, “Oily” Wragge, provides us a sardonic perspective on the aristocratic pretensions of Rosie’s parents, the McCoshes and vivid reflections on his WW1 experience in the Middle East and sense of relief over surviving a brutal time as a POW at the hands of the Ottoman Turks. One of Rosie’s sister is married to a minister who writes novels that feature necromancy (communication with the dead) and shocks his superior in the church that the Old Testament God “actually is the Devil, pretending to be God.” Another sister, Christobel, is attuned to the avante garde of the Bloomsbury circle, lives in lesbian relationship, and schemes for some way to raise children of her own. As part of a trilogy, one can see the obvious arc of World War 1 in the first phase (“The Dust That Falls from Dreams”, at hand for me but unread), the interwar period with this, and then World War 2 for the finale. With that framework, one can imagine that some of the apparent diversions here serve to interface the eras as well as to sow seeds for characters who will become more important in the volume to come. Compared to the drama of the author’s wonderful “Corelli’s Madolin” and “Bird Without Wings”, this volume has a satisfying lightness and play about the bounty of life “left over” after our characters experience world events such as war and the waning of good ship Britannia’s empire. The humor moves the needle more toward his earlier satirical trilogy about a wacky ensemble of characters in South America (of which I’ve only enjoyed “The War of Don Emanuel’s Nether Parts”), but it is more of the charming type and doesn’t go over the top or break into magical realism. Daniel was a legendary WWI Flying Ace, a survivor of the war now facing an immensity of endless days filled with trivialities. As a tea manufacturer in Ceylon, he has the company of Hugh who was also a pilot in the war, and a bright future in an exotic land. Daniel's wife Rosie is pregnant with their second child. After the war, Daniel's brother Archie went to India, He is a risk taker and a drunk, in love with Rosie who married Daniel after her fiance died in the war. Rosie's sister Otillie in Daniel was a legendary WWI Flying Ace, a survivor of the war now facing an immensity of endless days filled with trivialities. As a tea manufacturer in Ceylon, he has the company of Hugh who was also a pilot in the war, and a bright future in an exotic land. Daniel's wife Rosie is pregnant with their second child. After the war, Daniel's brother Archie went to India, He is a risk taker and a drunk, in love with Rosie who married Daniel after her fiance died in the war. Rosie's sister Otillie in England is in love with Archie, but he distrusts anyone who could love him. He prefers his hopeless and unrequited love for Rosie. He writes to Otillie,"You could not have have been my salvation, because no one ever will be. I am one of the damned..reconciled to my fate here in this most godforsaken and lunatic corner of the Empire." Daniel and Archie also lost two brothers in South Africa. The war haunts Daniel and Rosie. For the moment they are living on the tea plantation like kings in paradise, expecting a second child. But happiness is elusive, and their marriage is imperiled by tragedy. Rosie retreats into religion leaving Daniel to find love elsewhere. Daniel dearly loves his children, especially his eldest, Esther. But as the marriage falls apart the children become pawns. Their generation fought to save civilization. Louis de Bernieres writes that returning to civilian life, some men became drunks while others turned inward, some embraced the new world while others returned to their old life repressing the war into distant memory. Each character has been scared and altered by the war. "Mr. Wragge was content in his modest paradise. After the death marches, and the months of tunneling in the mountains with a pick, this English garden was indeed a dream of Eden...Oily Wragge was determined to salvage his sanity out of the purgatorial experience of captivity." So Much Life Left Over was a wonderful read, with gorgeous writing and interesting, conflicted characters. Daniel and Rosie and their families were wonderfully drawn. There are moments of humor and scenes of great sorrow. Even the minor characters, like Rosie's mother Mrs. McCosh and Oily Wragge are memorable. Daniel and Mr. Wragge go to Germany to start a motorcycle business with former POWs Daniel had captured and befriended. Daniel witnesses firsthand the rising anti-Semitism that fuels the rise of Hitler. The dynamics are eerily familiar and disturbing. Nearly 100 years later, and we seem to be repeating history. The novel continues the story in The Dust that Falls From Dreams, which I had not read and which one does not need to have read to enjoy this book. So Much Life Left Over has an open ending, with Daniel making a momentous decision. I felt I knew what he decides, but I am sure there is going to be another volume to continue his story. In the meantime, I do want to read more by de Bernieres, who also wrote Corelli's Violin. "If you have been embroiled in a war in which you confidently expected to die, what were you supposed to do with so much life unexpectedly left over?" That's the question Louis de Bernières seeks to answer in SO MUCH LIFE LEFT OVER, his second novel about the McCosh and Pitt families and their extended circle of friends, neighbors, servants, comrades, and others. The preceding novel, THE DUST THAT FALLS FROM DREAMS, followed his large and varied cast of characters during the First World War and t "If you have been embroiled in a war in which you confidently expected to die, what were you supposed to do with so much life unexpectedly left over?" That's the question Louis de Bernières seeks to answer in SO MUCH LIFE LEFT OVER, his second novel about the McCosh and Pitt families and their extended circle of friends, neighbors, servants, comrades, and others. The preceding novel, THE DUST THAT FALLS FROM DREAMS, followed his large and varied cast of characters during the First World War and the immediate postwar years. SO MUCH LIFE LEFT OVER picks up the story and covers most of interwar period and the early years of the Second World War. I like the broad arc of his story, and his prose is always witty and readable. The narrative bounces around from character to character and also mixes in letters, diary entries, newspaper clippings, etc. This is well-constructed, clever fiction that is often very funny and often deeply moving. It's very hard to put these books down once you've started. Although his large cast of characters and big historical canvas could be a recipe for trouble, I find that he juggles it all nicely. The characters all emerge from the page as authentic, and de Bernières finds a way to humanize them all with great warmth. He clearly has a great fondness for his characters (some of whom are based on his own ancestors), and we can't help but share that. But it's that very warmth and fondness that I think is at the root of what's least successful about the McCosh/Pitt novels. For all their charm, it sometimes feels as if a certain depth is lacking in the two novels. There's a prevailing comic tone that doesn't always fit: sort of like Pat Barker's First World War novels crossed with P. G. Wodehouse. Despite the hell of war and its aftermath, almost everyone is quirky, well-intentioned, and relentlessly decent. There's very little true villainy, cruelty, or cowardice on display. Everyone has a stiff upper lip and, by Jove, these demonstrably good people just get on with it. Their eccentricities, excesses, and mistakes (like Hamilton McCosh's string of mistresses, or Mrs. McCosh's prejudices and boorish behavior) are generally forgiven in a spirit of jolly good humor. There's a certain falseness in this fictional world of endlessly good motives, where nearly everyone obeys the law, is stalwart and brave, and tries so hard to do the right thing. This depiction of the world diminishes some of the emotional intensity his story might otherwise have. For lack of a better way of putting it, the McCosh/Pitt novels can be a sort of "Downton Abbey" experience. Both share a similar setting in terms of time and place, and both show us a Britain that is dealing with the devastation of war and struggling with the massive social and economic changes of the postwar years. With both, there's a warmth and familiarity, and we can't help caring about the fate of these characters through all their triumphs and tragedies, loves and heartbreaks. In the end, both are just so damn likeable and comfortable. But both also can ultimately feel a bit slight and leave us wishing for more. Of course, truly terrible things do happen to the characters in these novels. There is darkness and despair, and we're shown the evil and ugliness that exists in the world. There are harrowing depictions of combat and its aftermath. People suffer and die. And that's where I think SO MUCH LIFE LEFT OVER may be more successful than its predecessor. The story get progressively darker, and by the end, de Bernières doesn't allow the comic relief to overwhelm the sadness. He's willing to let us feel it and linger in it. Rosie, a character who is very sympathetic to us, engages in some terrible behavior. We see her pain and suffering, and understand why she acts as she does, but her cruelty isn't minimized or excused. D: "When I was younger I had absolutely no idea that it's utterly impossible to live without so much subterfuge, so many compromises, and secrets and lies." C: "You can perfectly well live a dull life without them, but who wants a dull life? When I'm on my deathbed, I don't want to be lying there thinking about all the things I never did." Their relationship is more complicated and interesting than those we generally saw in the first novel. There's an understanding of the profound hurt and damage that can result from even "good" choices made with the best intentions. SO MUCH LIFE LEFT OVER has a moral ambiguity and complexity that the first novel sometimes lacked. I'll be back for any future installments, that's for sure. (I assume/hope that at least a third novel is planned, based on how this one ended.) As I said, these books are charming and just so damn likeable. This story sneaked up on me and its full impact didn't hit me until the final chapters. Throughout the reading of more than two thirds of this, I was wondering why I was supposed to care about the characters. They felt shallow, unsympathetic, unlikeable, somewhat petty, living superficial, privileged lives. But the more I read, the more I began to suspect that this was perhaps the author's intention. These people had been intensely involved in WWI and now it's 1920 at the beginning of the book. This story sneaked up on me and its full impact didn't hit me until the final chapters. Throughout the reading of more than two thirds of this, I was wondering why I was supposed to care about the characters. They felt shallow, unsympathetic, unlikeable, somewhat petty, living superficial, privileged lives. But the more I read, the more I began to suspect that this was perhaps the author's intention. These people had been intensely involved in WWI and now it's 1920 at the beginning of the book. When the Great War ended, they seemed to founder (and even flounder), perhaps with survivor's guilt, and not know what to do with "so much life left over." The story has as its central figure Daniel Pitt, former RAF flying ace and war hero, now living an expat life in Ceylon with his wife Rosie, a wartime nurse. It seems to be an idyllic life on the surface but cracks in its perfection soon become visible. Rosie, for one, isn't a happy person and seems bound and determined to make Daniel unhappy too. And Daniel, denied Rosie's affection, seeks companionship elsewhere (and elsewhere and elsewhere as the story progresses). The characters, unsympathetic and shallow as I found them all, did have their appeal. When Daniel and Rosie move back to England at Rosie's insistence, we have a comedy of errors and manners densely packed with quirky characters: The McCosh family of Rosie and her three sisters and their parents, Daniel's troubled brother Archie and their mother, friends and significant others and offspring of many, the McCosh gardener, Oily Wragge (just had to mention his name), an ex-soldier who went through a lot during the war and was one of my favorite characters. There's much here that is funny, absurd, and ridiculous, especially in the part of the book taking place after the Great War and well into the 1930s, a time when the characters are trying to adjust to post-war life. It's entertaining in a superficial way. Then with the introduction of WWII, the serious finds its place along with the absurd. As a matter of fact, there are some poignant, sad, and touching moments in the last third of the book that affected me viscerally, giving me a lump in my throat. Kudos to author de Bernieres for being able to densely pack a short (275 pages) book with so much. There is social commentary, about British colonization and its impact on a country and its natives, about the British class system, about marriage, about war and its impact on countries and individuals, about prejudice and bigotry and antisemitism. And huge amounts of historical facts and tidbits about the 1920s and 1930s, much of it in a somewhat Billy Joel's We Didn't Start the Fire way for high school students, in that you might not be familiar with all the info thrown out there rather incidentally, but that's what reference books and Google are for, right? The last third of this book, with its emotional impact on me, saved it from receiving only 3 stars from me. This is, BTW, the second in a planned trilogy. The first book, THE DUST THAT FALLS FROM DREAMS, about these same characters before and during the Great War, came out in 2015. The third one, obviously still to be released much farther in the future, will find them post WWII, I imagine. The author has me interested enough to read about them a third time, whenever that will be. So much book left over. When authors come to the second volume in a trilogy, they sometimes manage a subtly interwoven catch-up which is much appreciated by those of us with less than stellar memories. Unfortunately, this is not the case here. But no matter because a desperately sad and really rather gruesome event early on in the book prevented me from going any further. Apologies, therefore, for not being able to provide a more substantial review and my thanks to Harvill Secker for the ARC via So much book left over. Apologies, therefore, for not being able to provide a more substantial review and my thanks to Harvill Secker for the ARC via NetGalley. In SO MUCH LIFE LEFT OVER, the reader holds in her hands an entire world where she will become intimates of the men and women on the pages. These characters are both traumatized and cause trauma. They make awful decisions--from the small and foolish to the epically cataclysmic--and yet they are profoundly endearing because of their enormous capacities for love. De Bernieres titles each chapter, making little stories of them. Narrators and points of view ch Prepare for infatuation and heartbreak. This is a book with a complex storyline and many different characters. Upon reading it I didn't realise it's actually a sequel to another book "The Dust That Falls From Dreams". I don't feel like I missed anything by not having read the previous book, but on the other hand I did struggle at the beginning of the book to get the hang of all the characters and who they are, because there are so many. The characters are all members of the same family, or connected to the family. The main character is This is a book with a complex storyline and many different characters. Upon reading it I didn't realise it's actually a sequel to another book "The Dust That Falls From Dreams". I don't feel like I missed anything by not having read the previous book, but on the other hand I did struggle at the beginning of the book to get the hang of all the characters and who they are, because there are so many. The characters are all members of the same family, or connected to the family. The main character is Daniel, and the book follows him and his extended family through the period between the World Wars. Daniel was an flying ace in World War I, and he and his wife moved to Ceylon following the war. He is blissfully happy there but she is not, and the main story throughout the book is the decline of his marriage and how this effects his relationship with his children. There were a lot of colourful characters in the book. My favourites were Oily Wragge the gardener, the very bohemian couple Christabel and Gaskell, and Daniel himself, although he definitely makes some questionable decisions, he also has a lot of heartache and loss to deal with in the book. This marvelous cast of characters are entertaining, interesting, endearing, and sometimes frustrating, but they are ALWAYS veddy veddy British. The dialogue between characters delights me to the core, and the "Brit wit" reminds me again why I love de Bernieres, and other "veddy" British writers (e.g., Chris Cleave who's, "Everyone Brave is Forgiven", is another novel to which I long for a sequel.) Think Noel Coward-esque dialogue and eccentric characters. Most of the characters were neighbors who grew up together outside of London, and each suffered losses during The Great War. Now, these friends and siblings have dispersed and, having survived death and destruction - no longer expecting to die at any minute, they have “so much life left over” that they must cope with. “So Much Life Left Over” isn’t all wit and fun, these characters experience tragedy, disappointments, bad marriages, and heartbreak, just like “real life”. I felt tears coming just as readily as laughs. 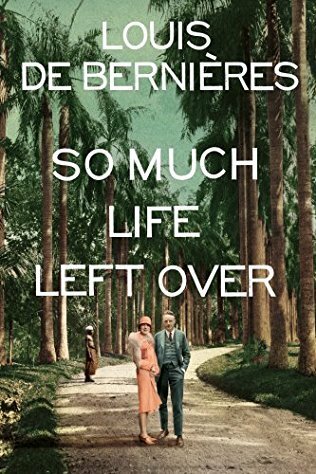 I suspect that there will be no sequel to “So Much Life Left Over”, because, as the story progresses into the 1930s and 40s, de Bernieres quite elegantly starts to give us brief glimpses into the characters’ future which serves to bring some closure for the reader. If “The Dust that Falls from Dreams” left me slightly unsatisfied, “So Much Life Left Over” left me perfectly satisfied. AND looking forward to whatever Louis de Bernieres writes next! Thank you to Knopf Doubleday Publishing Group | Pantheon for allowing me to read an eARC of this. Unfortunately, I got to it very late. The good news is that I really enjoyed it. I read it in one day, and couldn't seem to put it down. It is the second book in the series, but I didn't seem to have trouble with that. I may even pick up the first one just to see if I actually missed anything. You follow a cast of characters, which are developed quite well. The main ones are Rosie, Daniel, and their Thank you to Knopf Doubleday Publishing Group | Pantheon for allowing me to read an eARC of this. Unfortunately, I got to it very late. You follow a cast of characters, which are developed quite well. The main ones are Rosie, Daniel, and their daughter. They try to move on from the first World War, and fix their marriage, which seems impossible at this point. You also follow Rosie's sisters, who are also dealing with their own challenges. I didn't go into this novel expecting to like it as much as I did. It's definitely dark, and heartbreaking. It has its moments though. The children in the story were so innocent, and you just want to give them a hug. The family dynamic in this is very hard to follow. It's hard to read about. There is cheating involved, and the guys often have multiple children from other women. I would think it was actually like that during that time. This is a war novel, and it talks about Hitler more toward the middle/end, but it doesn't just focus on that. That's what I love about it. I wasn't sad the entire time. I do tend to get a little bored of a novel JUST talks about war, and fighting. I'm not saying that war is boring, so please don't take it that way. It's just not something I tend to enjoy reading about, obviously. I have been a huge fan of Louis De B ever since he was named as one Granta's Best of Young British Novelists back in 1993. It has been a delight to see how his career has progressed and I have loved everything he has written. ‘So Much Life Left Over’ has not disappointed. It is a captivating and absorbing book both humorous and tragic. What I particularly loved were the small cameos of characters from De B’s other novels, ‘Captain Corelli’s Mandolin’ and ‘Notwithstanding’; delightful. The novel i I have been a huge fan of Louis De B ever since he was named as one Granta's Best of Young British Novelists back in 1993. It has been a delight to see how his career has progressed and I have loved everything he has written. ‘So Much Life Left Over’ has not disappointed. It is a captivating and absorbing book both humorous and tragic. What I particularly loved were the small cameos of characters from De B’s other novels, ‘Captain Corelli’s Mandolin’ and ‘Notwithstanding’; delightful. The novel is set between the first and second world wars. It feature Daniel Pitt WW1 flying ace, who, now it is peacetime, feels he has so much life left over. He has a troubled marriage to Rose with whom he has two children. Amongst the other characters are Daniel’s brother Archie and Rose’s three sisters and we follow their lives up to the outbreak of the Second World War. As with all De B’s novels the writing is beautiful and the characterisation is tremendous. I really engaged with the story and was sad when the book ended. I’m guessing there is going to be a third novel in the series and I can’t wait. An excellent sequel to The Dust that Falls from Dreams. This book covers the inter wars years and how the family members cope with making adjustments to their way of life. It is beautifully written and you can really get to know all the characters. Each has a different lifestyle which makes the book so interesting. I was sorry when it finshed! A continuation, or sequel, of the familial lives found in The Dust That Falls From Dreams, but at half the length, making this feel more like brief glimpses and scattered episodes rather than a cohesive whole. The result is a fast read but one less entrancing than its predecessor, though it does not stint on the tragedy. Rosie and Daniel have moved to Ceylon with their young daughter to start a new life at the dawn of the 1920s, attempting to put the trauma of the First World War behind them, and to rekindle a marriage that grows increasingly colder. However, even in their new life, it is hard for them to escape the ties of home and the yearning for fulfilment that threatens their marriage. Back in England, Rosie’s three sisters are dealing with different challenged in their searches for family, purpose and happ Rosie and Daniel have moved to Ceylon with their young daughter to start a new life at the dawn of the 1920s, attempting to put the trauma of the First World War behind them, and to rekindle a marriage that grows increasingly colder. However, even in their new life, it is hard for them to escape the ties of home and the yearning for fulfilment that threatens their marriage. Back in England, Rosie’s three sisters are dealing with different challenged in their searches for family, purpose and happiness. These are precarious times, and they find themselves using unconventional means to achieve their desires. Around them the world is changing, and when Daniel finds himself in Germany he witnesses events taking a dark and forbidding turn. Wow, what a read! I have not stopped recommending this to people since finishing it, I absolutely adore everything about this book and it is definitely my favourite read of 2018 so far! Confession time, I have not read the first book to this, ‘The Dust That Falls From Dreams’ but I definitely will be after reading this! I have to say, not having read the first book did not detract anything from this book, it does work as a standalone, everything is explained sufficiently to understand what is happening and what has previously happened and this is testament to how good a writer de Bernières is. As I have said, I adored everything in this and I really did. The plot is wonderful, full of dramatic events, heart-warming moments as well as sad moments, the characters are fantastic, more on this later and the writing style is almost out of this world. This is written in a way that really transports you to another place, I completely lost myself in the book and the goings on and this is just the perfect book to lose yourself in for a while. The characters are so well crafted, very realistic, people that have aspects that you like, love, hate and everything in between, it was a joy to get to know them, experience their lives, live the world through their eyes and see how everything resolves itself in the end. ‘So Much Life Left Over’ is a very special read, one that is absorbing, humorous, happy and sad, this has a special place in my heart and I will continue recommending this to everyone I talk to for a long time. Daniel Pitt longs for the glory days when he was a Flying Ace in WWII. The camaraderie of his fellow pilots and avoidance of petty squabbles because of the daily reality that some will live and others will die every time they take to the air in battle. Now, the war is over and he is married to Rosie, a former wartime nurse. They live in Ceylon, which Daniel loves and Rosie hates. They have two children whom Daniel adores. Rosie is continuously demanding they return to live in England and Daniel Daniel Pitt longs for the glory days when he was a Flying Ace in WWII. The camaraderie of his fellow pilots and avoidance of petty squabbles because of the daily reality that some will live and others will die every time they take to the air in battle. Now, the war is over and he is married to Rosie, a former wartime nurse. They live in Ceylon, which Daniel loves and Rosie hates. They have two children whom Daniel adores. Rosie is continuously demanding they return to live in England and Daniel is heartbroken, as his love for the natives and their culture, especially one woman in particular, have to be sacrificed for his wife’s sanity. Louis de Bernieres is a superb writer who gives the reader characters we want to meet and get to know more and more. The plot is simple but the complexity of character portrayal makes this a sequel one can enjoy as a stand alone novel. Rather than stereotype these British characters and their thoughts about colonization, religion, etc., we instead have several narrative voices who when combined produce an outstanding work of historical fiction! Highly recommended reading! Now this reviewer wants to read the first novel in this series and looks forward to the next one! Daniel Pitt was an RAF ace pilot. When WWI ended, Daniel settled in Ceylon with his wife, Rosie, and their daughter. The family was happy there, for a few years, until the second child was born deformed, and died, shortly after birth. Both Rosie and Daniel grieved their deceased baby. Rosie wrapped herself in religion to survive her overwhelming So Much Life left Over is a captivating and compelling historical fiction novel. The story takes place between the end of WWI and the beginning of WWII. It's been a long time since I'd read any Louis de Bernieres, so when I got the chance to read "So Much Life Left Over" from Netgalley, I jumped at it. This is a beautiful, bittersweet, moving novel that follows the lives of various members of a family and their associated friends from Ceylon back to the UK with a side trip to Germany over a period spanning the early to mid twentieth century. If you love de Bernieres' writing, you won't be disappointed by this. 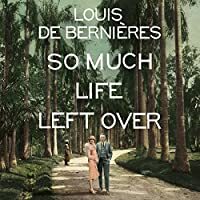 It's sad and you may well shed a tear It's been a long time since I'd read any Louis de Bernieres, so when I got the chance to read "So Much Life Left Over" from Netgalley, I jumped at it. If you love de Bernieres' writing, you won't be disappointed by this. It's sad and you may well shed a tear or two, but the characters are so brilliantly observed, you won't mind, as you're swept along with the lives of the characters. It takes a while to figure out what So Much Life Left Over by Louis de Bernieres is about and what it is not. The description speaks about lives upended by World War I, but this book is more about relationships than the war. The cover image depicts Ceylon and India, but the book returns fairly early on Britain. Ultimately, this story is Daniel's, and it is this story that keeps me reading until its ending, which seems poised to ask again the question that the story initially poses. Read my compl It takes a while to figure out what So Much Life Left Over by Louis de Bernieres is about and what it is not. The description speaks about lives upended by World War I, but this book is more about relationships than the war. The cover image depicts Ceylon and India, but the book returns fairly early on Britain. Ultimately, this story is Daniel's, and it is this story that keeps me reading until its ending, which seems poised to ask again the question that the story initially poses. #FirstLine ~ The crackle of gunshots bounced between the mountainsides, the percussion fading with each return echo. This book was very well written and drawn out. The story was heartbreaking, compelling and original. It is a story that crosses time and distance while showing how friendships ebb and flow, how life can make us feel things so very deeply, makes us face things head on and inevitably force us to continue on. A great read and one that will make you think long after you close the page. I enjoyed this story and was surprised to read that it was part two of a trilogy. Have now downloaded part I to read on a long flight! Louis de Bernières' use of the English language is always a great pleasure. Plus, I learn the odd new word here and there! I could imagine all the weird and wonderful people of all ages, plus some "normal" ones, who populate this story. Very much enjoyed it. Recommend. I'm not sure what I was expecting of this book, but in the end I really enjoyed it. Set mainly between the 2 world wars, it is the story of Daniel Pitt and his family. It starts in Ceylon, where Daniel and his wife, Rosie, and young daughter, have started a new life after the war. Back in England, their families are also looking for ways to move forward after the losses of the conflict. The best thing about this book is the abundance of wonderful, well observed characters. How can you not love a I'm not sure what I was expecting of this book, but in the end I really enjoyed it. Set mainly between the 2 world wars, it is the story of Daniel Pitt and his family. It starts in Ceylon, where Daniel and his wife, Rosie, and young daughter, have started a new life after the war. Back in England, their families are also looking for ways to move forward after the losses of the conflict. The best thing about this book is the abundance of wonderful, well observed characters. How can you not love a man called Oily Wragge? Or old Mrs McCosh with her air rifle and obsession with the royal family. This is a funny and moving novel, which I thoroughly recommend. Thanks to NetGalley for a preview copy. I loved it, and then it ended. Please say there is another book coming! I can't stand not knowing more about Daniel and his family. Loved it. There’s something really satisfying about LDB - and part 2 of the this marvellously rich trilogy does not disappoint. Sigh - now to wait for part the third. With thanks to Random House Vintage via NetGalley for the opportunity to read an ARC. Not for me, I'm afraid. Wat een flutboek. Maar ik had het kunnen weten na deel 1 .... Vlak verhaal.